Today is the 4th of July. For most of the world, this is just another day. For those of us in the United States, it's a day that we get to celebrate our independence. 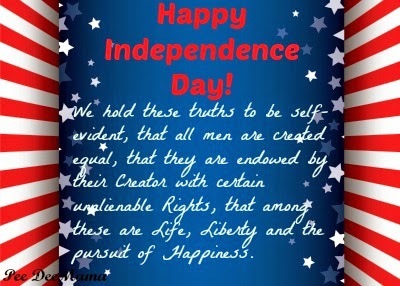 A day we celebrate the freedoms fought for in the Declaration of Independence and guaranteed us in the Constitution. Unfortunately, I fear too many Americans have forgotten why we celebrate today. Our focus is on gathering with friends and family, cookouts, baseball games, and fireworks. None of those things are bad, and I'm not saying we shouldn't do those things to celebrate; those things shouldn't replace our remembrance of why today is a day of importance. Drafted by Thomas Jefferson in June of 1776, the Declaration of Independence summarized the philosophy of individual liberty expressed by the Continental Congress and listed the grievances against the King of England that justified breaking away into a new nation. 56 men from the 13 colonies risked their lives to sign it, knowing that by doing so they could be found guilty of treason. The freedoms guaranteed to us as United States citizens are anything but free. They were bought through the blood of 25,000 men in the Revolutionary War. Since then, over a million more have given their lives defending our freedom. So as you celebrate today, take time to remember WHY you are celebrating.